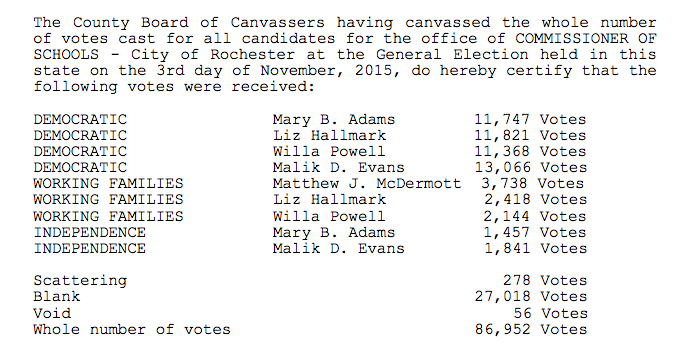 One of the most startling and baffling realities about last week's results was that people were acting like there was no Rochester City School District Board of Education Election. I get it that the two candidates were unopposed, but still, does it NOT matter that the Board will soon get new blood --- who brings a platform that is unlike that of any of the other six members, i.e., a platform based on COMMUNITY ORGANIZING FOR DEADLY SERIOUS, AUTHENTIC EDUCATION REFORM? We wanted to ensure that she received decent numbers --- in order to affirm that voters support her direction. Based on final numbers --- they definitely DO (50% of the vote). Judith Davis far outpaced the votes recieved by incumbents of the 2015 school commissioner election by a scale of 3 times their vote total. Not bad for a newcomer --- in fact pretty darn good (even though it was NOT acknowledged by her Party last night). Mark my word --- even though (in Joe Morelle's shadow) --- it hardly seemed important last night --- in a day or two --- education will once again rise (as it ALWAYS does) to the top of the agenda --- as one of, if not THE most important issue that MUST be addressed in Rochester. We know that Reverend Judith Davis can't wait to get to work --- because she told us so. With OUR CONTINUED BACKING --- a golden opportunity exists to do some things in the Rochester City School District --- that have NEVER been done before --- such as (for example) --- advancing a comprehensive Racial Equity Action Plan.